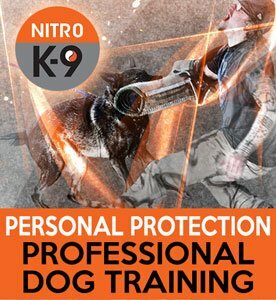 There are a lot of ways to train a dog to protect you, property, or a certain space or area. There are fantastic protection sports out there that we can all learn from. But at the end of the day, these systems are far more involved than what the average person needs in a protection dog. Don’t get me wrong: I am a fan of dog sports and have the deepest respect for them and how they apply to personal protection. 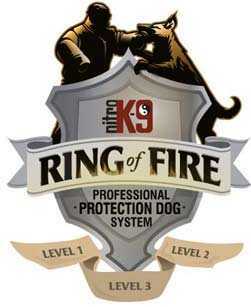 I love French Ring as a practical protection training system as a dog, for instance; the same with Schutzhund and KPNV. But these are entire systems designed to challenge dogs to perform at unheard of levels in tracking, guarding, and general obedience—and then fearlessly find a man and bite him. Very few dogs are able to reach the top levels. The people who come to me don’t need their dogs to do everything involved in these systems, and they don’t have the time. 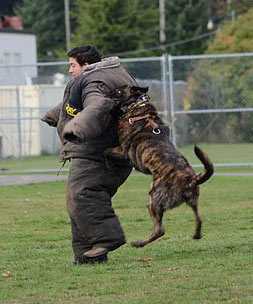 What they need is a dog that will bite under command, withstand environmental pressure, and abort before biting, or be fast to release a bite and return to the handler. That’s why I developed the Nitro K-9 Ring of Fire program. I have taken what I feel are the best elements of French Ring, Mondo, and other systems, and then condensed them into a prey and defensive drive protection system. It uses these core drive principles from the above systems to achieve the perfect protector in less time and without the stress of competition. The Ring of Fire is a comprehensive system, but it is meant for the real world. It is designed specifically to achieve the perfect protector in less time and without the stress of competition. It focuses on utility and reliability. For instance, we teach modern tactics and practical street application. We avoid equipment fixation and teach practical disarmament techniques. We isolate and activate the correct drives that are needed to be successful, and prevent these drives from coming out in undesirable ways. I believe a dog should recall at all times and out instantly upon command. The Ring of Fire is not about breed, pedigrees, or papers. It is about ability. It is not a sport. There are no points. Your dog can do it—or not. All dogs are required to have Level 1 and Level 2 certifications or comparable training before admittance into our program. If you have a puppy and come to us for training, we can start doing some foundational work, such as imprinting the bite. Packages include complimentary lifetime phone and email support. If you’re purchasing a puppy, we urge you to be cautious. Research the kennel and ask for references. And examine the bloodlines closely. You can tell a lot about a puppy from its pedigree. It doesn’t have to be registered. Research whatever information you are given on the breeding parents. More and more breeders are reporting flat or dogs with no nerve or drive. You will see dogs that have no nerve in the litter and a few who do. This is why you sometimes see both “pet” and “working” quality from the same litter. We feel this occurs when the kennel needs to bring in new blood; these “inbreedings” should be avoided. If this is common at the kennel, I would advise you to avoid it. The fact is, Americans (and even a lot of European countries) are not breeding the old European way, which is for performance. Instead, many breeders go for titles and passing those titles on. 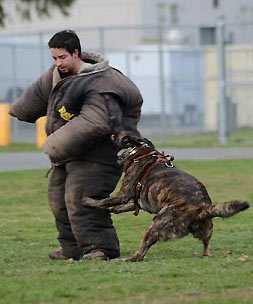 This is universal for the show world, but is becoming increasingly common for working dogs too. We think dogs should be bred to preserve the traits of the breed as a whole. In other words, if they are ring dogs, they need to be high in prey drive. A Dachshund should be bred to work and hunt as the breed was meant to. Labs should come from strong working lines, such as hunting or tracking. In addition, we also think the gene pool is fine. Dogs don’t need to be inbred to be successful, and my view is that many people will claim a certain dog’s name in the pedigree to add perceived value to the litter and drive costs up. I know some breeders REALLY and TRULY believe that line breeding is necessary to pass on behavioral traits from certain dogs, but I do not agree and I never will. By the same token I love knowing where my dogs came from and what the dogs in their bloodline were like. These are just my personal feelings and I know not everyone will agree with them or what I am saying. No disrespect is intended to anyone in anyway. We all love our dogs! I think the working ability of each dog regardless of bloodlines is what matters. That’s the reason I like the KPNV, the Dutch police dog training system. They don’t require a pedigree; it’s based solely on ability. Finding a good dog should not be about titles and fame, but working ability and soundness of mind. Research everything. Ask questions. Keep in mind that even dogs bred to work protection will have vastly different temperaments and personalities depending on the sport in question. Go with your gut.